Well, as usual it’s over a week into a month and I’m only just finding the time to sit down and plan out my monthly goals post. Still, last night I had a very productive evening, completing all of the tasks I wanted to and I felt like I should keep the momentum going. Household – Easter is just around the corner and once the holidays begin I want to dedicate as much time as possible to fun activities with my family. That gives me just over 2 weeks to get as much done around the house as possible so that I can really enjoy my holidays. I’ve written one of my trusty lists and I’ve made a really good start tonight. Just need to keep it up for the rest of the month. Decorate the house for Easter – I love Christmas but it has one definite downside. It only comes around once a year. I’m determined to find more opportunities throughout the year to decorate the house and throw a big celebration. Easter is just one of these opportunities and I’m hoping to really make an effort this year with the decorations. Keep your eyes peeled for an Easter decorating post soon! Blogging – March is set to be another busy month with lots to distract me so I don’t want to make any promises where the blog is concerned. This is not the time to start trying to go overboard on the blogging front. Having said that, I would like to continue to blog at least once a week and dedicate a little more time to my social media accounts. Can’t have my loyal followers thinking I’ve abandoned them! Reading – I’m still loving the romance novels and I doubt that is going to change anytime soon. I would like to finish The Colour Purple though, just to prove that I am actually capable of reading something more heavy-weight and possibly even start the next book in my reading challenge. The most important goal for this month is not to try too hard. There’s no point trying to overdo things and push my limits when I haven’t got myself on an even footing. March is about taking stock and retaking control of my life. I spend far too long chasing my tail, feeling like I’m playing catch-up. It would be nice to be on top of things again. So that’s March. I’ll review at the end of the month and see how successful I was. 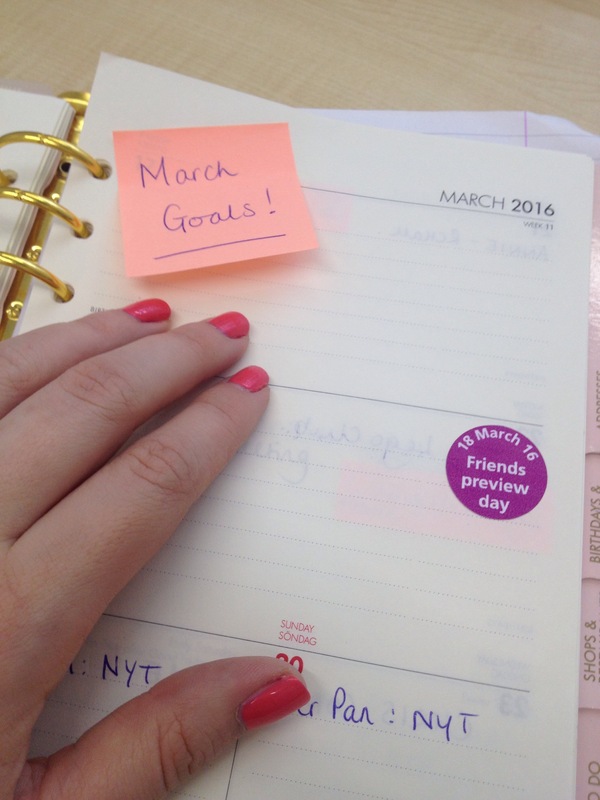 What are your plans for March? Do you have anything big planned or will you be taking it easy? This entry was posted in Uncategorized and tagged blogging, life, lists, march, monthly goals, to do list.